The Oral-B Pro 5000 brush head has floss-action bristles that make a micro pulse that plough away plaque in between teeth for effective cleaning. It has a Bluetooth connection to Smartphone that you can feed data of your teeth brushing. This will help you adjust your brushing as you work towards attaining your goals. It operated on the Oral B patented 3d angled cleaning that pulsates, rotates and oscillates to remove way more plaque from the gumline than manual toothbrushes. It has a timer (quadpacer) and pressure sensor to aid you to brush gently without damaging your gums. It comes fitted with a wide range of cleaning modes: Gum care, Daily clean, deep clean, sensitive and whitening. TheElectric Rechargeable iBrush (black) – Sonic Wave Electric Rechargeable Toothbrush with UV Sanitizer, 3 Extra Brush Heads and Built In Brushing Timer with Multiple Brush Settings is designed and produced by a dental specialist, named Dr. Patty Martin. It works in 3 distinct modes; gentle, normal, and massage. Its ion technology battery lasts up to 6 weeks, it is ideal for travel. (ion technology ensures that your battery does not over-charge). It has a light indicator that signifies that it’s fully charged. It operates a feature called Quad-Sense which works like the Philips Sonicare smart timer (it alerts you by sending a pulse to the handle when you have completed brushing one quadrant so that you can move to the next one). It Oscillates up to 48000 strokes per minute (more than Phillips Sonicare brushes). It comes with three color coded brush heads that can be used by 3 other family members. 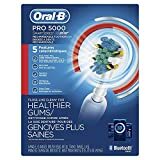 The Oral B Pro 3000 employs the patented 3D Oral B cleaning that cleans tooth by tooth in precision at an angle while rotating and pulsating to effectively remove plaque. It removes more plaque than a manual toothbrush. It has a specialized “cup” that whitens your teeth by scraping away surface stains on your teeth starting from day one. Whiter teeth starting day 1 Whitens by removing surface stains. You can now download an Oral B app on your android phone and use Bluetooth connectivity technology to connect it with your brush. Once connected to the app, your Oral B 3000 electric toothbrush will channel data to your app for your personalized review. This can help you assess whether you are hitting your oral hygiene goals and also help you figure out what to adjust. It is fitted with a 30 seconds timer to alert you when to move to the next section (quadrant) of your mouth. The timer aids you to brush for the dentist recommended two minutes duration for effective tooth cleaning. The 3000 Oral B comes fitted with a visual pressure sensor that lights up when you brush too hard. Brushing your teeth quite hard can be harmful to your dental care. The pressure sensor is called Daily Clean Plus visible Pressure Sensor. Gum Care Mode that massages your gums to remove plaque without any inflammation. 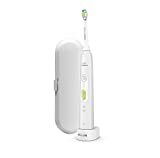 The Sonicare Philips Easy Clean Sonic Electric Toothbrush is a decent product that is slim durable and reliable. It removes two times more plaque than an ordinary manual toothbrush. It has a travel cap that enables you to hygienically carry your toothbrush when on the go. 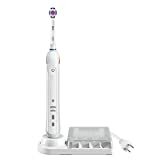 It is quite portable and has a ProResults brush head that is also in the popular Sonicare 2 Series. The Philips electric toothbrushes are known for their sonic cleaning technique that removes seven times more plaque than an ordinary manual toothbrush. The Philips Sonicare HealthyWhite+ features two modes: White and clean (for whitening your teeth and day to day cleaning). You can whiten your teeth by up to a couple of shades whiter in just a week of continuous cleaning. It cleans deep between your teeth for overall total clean. Diamond-shaped bristles that effortlessly scrape away hidden plaque. For maximum comfort and flexity, it has three intensity levels to enable you to adjust to your level. It has a quad pacer to ensure that you clean every quadrant (section of the mouth) effectively. The HX8911 is proven to remove stains from your teeth.